If you’re a frequent visitor of StickerYou’s Facebook page then you are likely already aware that we like to post about various custom sticker-creations our customers have designed. We love seeing all the different stickers or temporary tattoos people have come up with. Some are very attractive, inspirational, practical, and others are just plain hilarious. We like to give these creative folks a shout-out on our social media feeds to show our appreciation for their business as well as provide some ideas for others perusing our sites. However, this year instead of simply providing a weekly showcase of the best stickers that were printed in the past 7 days, we’d like to show you the best of the past 365 days. 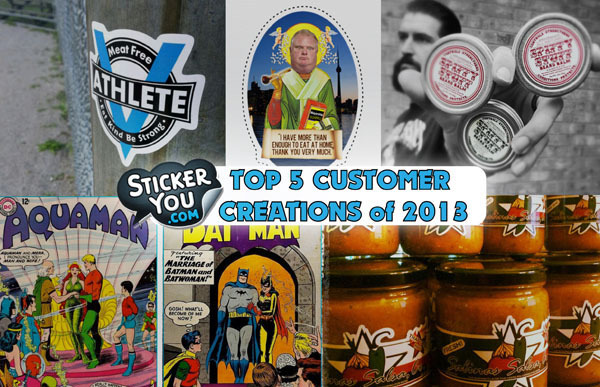 Thus: StickerYou’s Top 5 Customer Creations of 2013. That’s right, the StickerYou stickers crew has collected, debated and voted on which customers have proven that they know how to Make It Stick. So, without further ado, check out this year’s Top 5. Our first winner is Josh Wyatt. Josh and his wife had a beautiful comic book themed wedding, complete with comic book cover wine bottle labels. Each table centerpiece at the wedding had a wine bottle, each wine bottle has a label designed to look like a comic book cover. Each image depicted famous superheroes at the altar, just like Josh and his wife. They were so popular guests were bidding on who would get to keep each of the comic book bottles. Our second winner is Anne Marie Campbell, a fellow Torontonian and Meat-Free Athlete who runs and promotes a vegan nutrition and fitness website. Anne-Marie was inspired into this calling while doing research into animal cruelty and decided to take a pledge against eating meat while maintaining a healthy and active lifestyle. She made her stickers for the Toronto Vegetarian Festival. Check out Meat Free Athlete here. Third, we have our friends over at Mens’ Spiffy Stuff, the place for all bearded manly men. Jordan McMahon of MSS uses his stickers as labels on their line of products for men who like to maintain stylish facial hair. Their products warning labels say “may cause excessive manliness”. Gentlemen, prepare yourselves. Learn more about the gentlemen at Men's Spiffy Stuff. Olivia Gissig also made the Top 5. She is also from Toronto and has kept the StickerYou crew entertained with her witty pop culture stickers. She uses her stickers on prayer candles she makes and sells at markets and on her Etsy store. Olivia told us the prayer candles are so “people can worship their own idols”. Her most recent sticker was of Rob Ford. Visit Olivia's Etsy' store. Our last Top 5 Customer Creation comes from the awesome folks down in Texas, Salinas Salsa Co. these folks make delicious authentic homemade salsa in a variety of flavours. They sell their products at craft shows, farmers markets and other events. Their salsa jars are labeled with some beautiful stickers they printed at StickerYou. Thanks to everyone who made products with StickerYou this past year, we are certainly looking forward to seeing what rolls off our presses in 2014. Use promocode TopFive for 30% of your next order of 9 pages or less. Keep on making awesome stickers and labels!